During this re-examination of Nirvana’s set-lists one of my fondest desires was the hope that perhaps the band had left more hints in the later years regarding ongoing work. The stimulation behind that hope was that Nirvana did indeed test a couple of new pieces on the In Utero tour; firstly You Know You’re Right on October 23, 1993 followed by an unknown song on November 12, 1993 in Fitchburg that surfaced again on December 29, 1993 in San Diego. While the 1994 set-lists seem too well-known, and too rigid, to offer hope that either song appeared, I wondered whether the Oct-Dec U.S. tour offered potential. That phase of touring consisted of a total of 42 shows commencing in Phoenix, Arizona. You Know You’re Right was whipped out just five songs into the tour and in solid enough form that it suggests the September-October practices at the Universal City Soundstage in Los Angeles had involved decent time dedicated to the track. Certainly the song had been sufficiently rehearsed that when Dave Grohl announced “this is our last song, it’s called All Apologies,” only to be faced with Kurt kicking in the You Know You’re Right riff, he (and Krist and Pat) are able to lock step seamlessly without any sign of misfire or confusion. Alas, forecasting whether these two songs may have appeared again gets tricky. Firstly, we have to make the assumption that they were unveiled in the order they were thought of and choose whether we believe the first known appearances were indeed first. In the case of You Know You’re Right there is a partial set-list from four days previous. 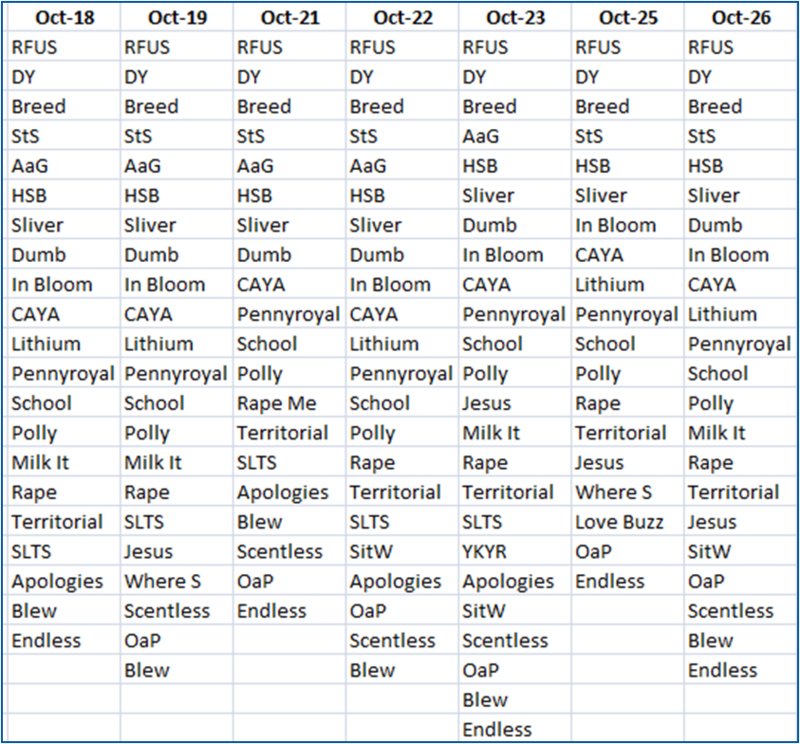 Comparing the October 19, 1993 set-list to those that come before and after, it’s identical to the previous day’s concert for sixteen songs in a row and to October 22 for fifteen. But it is visible that the set-lists are still flexing — the band skip or add in songs and are still unsure of the final order. If October 19 is indeed missing songs then it would make it as long as the Chicago show — how tantalising. Most likely, however, the set-list is missing Endless Nameless and/or Territorial Pissings, maybe All Apologies, or there’s a chance of Something in the Way… And yes, there is a chance of You Know You’re Right but the set looks near complete to me; Scentless Apprentice, On a Plain and Blew were the regular finishers even if the order wasn’t settled. The appearance of You Know You’re Right was so out of the ordinary, akin to the insertion of Love Buzz the next day, or Dive for one appearance on Halloween, or Sappy the next year, that there’s no way to use statistics to do anything other than show it was unlikely. The only nearby candidate where we’re missing a few songs is October 27 which is missing its conclusion, a supposedly “mostly acoustic encore”, which makes me think on that date we’re looking for Something in the Way, maybe Where did you Sleep Last Night plus some iteration of the Scentless Apprentice/Blew/On a Plain/Endless wrap up. As an aside, looking at the rest of 1993, there’s an intriguing case on November 29, in a complete set-list, where the band derail a pretty solidly established set by not playing Smells Like Teen Spirit or Come as You Are; given Kurt stops the set just before they would normally be played, having already inserted About a Girl in a different location, it looks like punishing the audience for some of the behaviour that was seen that night. Now then…How about the ‘unknown’ song…? Let’s see tomorrow.